Much speculation abounds regarding China’s gold holdings. They officially claim 1,054 tons as of April 2009. We suspected they might “re” announce their holdings again last year at this time as it was five years after their last announcement and China has a habit of “five year plans”. Alisdair Mcleod believes they have 20,000 tons or more which very well may be the case, I can easily make a case their holdings are far in excess of 10,000 tons just from the data since 2009. In the words of our newest presidential candidate, “at this point, what difference does it make?”. We’ll get to this shortly. Before getting into the answer to this question, it might be better look at China’s “bubbles” first. As you can see, China’s money supply has gone from 30 trillion yuan to over 120 trillion yuan in 8 years. The growth rate compounds out to about 18% annually. 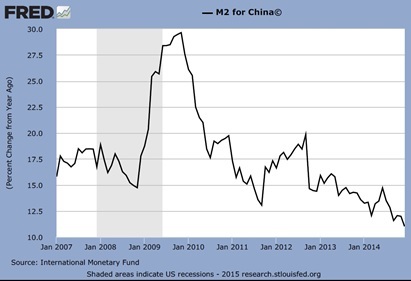 The following chart shows their money supply growth slowing drastically, China will need to reflate soon! 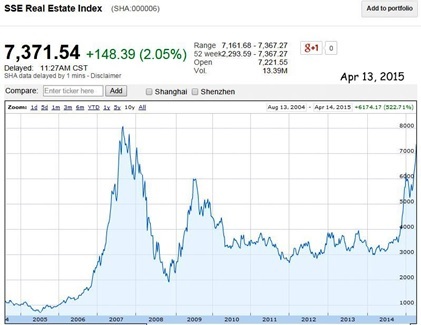 Now let’s look at China’s Shanghai stock market, another bubble. Their market has virtually doubled in over 90 days, is this “normal”? Could this be a function of the market anticipating a reflation in money supply …or maybe a devaluation of the yuan versus a marked up gold price? I’m not sure but putting their money supply together with market action tells me one of several things. Money supply must begin to grow more rapidly soon, the yuan will need to be devalued or their market values are unjustified, something must give. Add to this the fact China’s economy (maybe with slightly cooked numbers) is growing slower than any time in the last six years and it becomes even more clear, China must do something soon. It is my guess and has been for quite a while, China will pull a page from FDR’s playbook and revalue gold versus the yuan …and the yuan versus other currencies from top to bottom. So, why exactly does it matter how much gold China has accumulated and what are the ramifications depending what the number is? First, if the number comes in “large” (it will), it means China “likes gold” and believes it to be a worthy monetary reserve asset. A large number would give gold China’s “stamp of approval” so to speak. Next, we have the “mathematics” to the equation. If the number comes in anywhere near 10,000 tons, the natural question then becomes “where oh where did it all come from”? This is a VERY important question because as I’ve said many times before, gold can only come from current supply and also from above ground supplies in vaults. We know the total annual global supply (ex China and Russia) is about 2,200 tons of which China has chewed up a very large percentage over the last six years. Total global production has been 11,000 tons over the last six years, we know India and Russia have been importers, not to mention all the other geographical demand and jewelry. A number even close to 10,000 tons will raise the question of “how?”, how could China have accumulated this much gold if the world is not producing enough to make the math work? In other words, if China bought virtually all of the global supply, what was used to satisfy the rest of the world’s demand? The answer is easy and so will be the reaction. The gold MUST have come from Western vaults, namely N.Y. and London. It would also explain the refineries working 24/7 to melt 400 ounce bars and create kilo bars …they were in fact heading to China! The big questions will be “which vaults?” and then of course “who’s gold was it?”. This really matters because a number of 10,000 tons or more would most likely mean the U.S. has dishoarded its gold …and/or sold gold which belonged to someone else. It will bring up the rule of law if the gold is someone else’s, it will bring up Constitutional law if the gold came from Ft. Knox, West Point or another depository. Please remember that five years ago or so, gold on the market was turning up which had very similar, if not identical “fingerprints” to our own “coin melt” from the 1930’s. To me, this was as big a telltale sign as gold turning up in 1989 with the “Czar’s stamp” on it. The report of 10,000 tons or more held by China will on its own drive gold prices exponential because of the logic that market participants will connect swiftly. Between the “stamp of approval” and “where did the gold come from”, people will understand the West were the sellers. Does selling one’s gold make your currency weaker? Of course it does. Does a weaker currency make it harder to accumulate gold? Again, yes. It is my contention that not only will a weaker currency (the dollar) make it harder to “catch up” and replenish the empty vaults, China will have incentive to “help this process along” by forcing the price higher and more difficult to accumulate. As mentioned and illustrated above, China has not been immune to the bubblemania gripping the world. They are living their own bubble and have exploded their own money supply yet now have the need to goose it again. If this reverses and becomes an outright contraction, China will be faced with the same dilemma the U.S. was in 1932-1933, they will need to re price gold higher in an effort to devalue their currency and reflate their own system. It is for this reason I believe they will “set” a price and bid for any and all gold similar to what FDR did when gold was revalued to $35. A holding’s announcement and higher bid will do much for China. It will cement their position of financial strength and also lock many buyers out …not to mention turn some holders into sellers. Thus increasing China’s holdings even more. The higher gold price will act as a “filler” for many of the losses China will surely take from paper financial holdings. A higher gold price will be their internal financial penicillin assuring the financial wounds heal rather than spread and infect the entire body. Quite oversimplified but please understand this has been the remedy many times before throughout history, either willingly or dragged by the ears! Good short easy to understand piece Bill. Silver accumulation events. Hunt Brothers, Warren Buffet. Have a glass of wine and wait out the Ponzi. Over simplified maybe but still the right answer in the long run. History will tell us we were right. Bill, what is the risk of the number not coming in “large?” There is nothing to say China will announce their true holdings. What if they announce 2,000 or 3,000 tonnes? How big of a disappointment would this be for the gold market? yes, it may come in small and help them devalue versus other fiats …THEN versus very large gold hoard. China would be stupid to announce her numbers now! China tries to force the use of Gold as backing of currencies on ROW. Then the US try to combine the ideas and want SDRs with 5% gold backing. Now China says: YES, let’s do it BUT FIRST: show me your gold and I show you mine, because after all we are equal, aren’t we? And BOOM! The US are busted! They cannot allow inspections, because they have no more gold! And so the new gold asset standard is born! The only thing the Chinese have to do to win BIG is to keep their numbers secret now! thanks nity, no audit will ever take place. That is what I believe too. They might ultimately buy it secretly back (they must have outposts in shanghai…) at 10++ k USD an ounce, thereby bailing out the big banks that accumulate now (JPM) and then claim they had it all long. System is re-liquified, currency and debt again in balance with gold. But it will be a big mess along the way. could even become Mad Max along the way. It all comes down to valuation. Price, what’s the cost? The supply of currency (globally) will increase dramatically, whereas the supply of gold won’t. With price being determined by that old ‘golden rule’ of the interaction of supply and demand. On August 15, 1971 Nixon cuts loose the US dollar from gold. The amount of US dollars to gold ratio then was 8:1 using the monetary base (AMBNS) versus price of US Treasury. Using the same parameter, the current US dollar to gold ratio is 57:1 resulting in a supposed gold to paper dollars valuation of $68,400.00 per ounce! The final accounting will be epic! Those late to the “party” will find the shelves bare! No gold anywhere to be found, except at a price that 99% won’t be able to afford. That old tried and true supply and demand thing again. bare shelves for everything is the potential danger. 1. When the SHTF, all paper assets and paper denominated assets go to their intrinsic value of ZERO? Because there is nothing that is of REAL VALUE anyhmore except GOLD! 2. 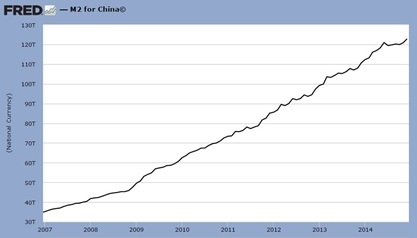 China wanted to – not just recoup the 100% losses on all their paper reserves, BUT also use this opportunity to ENRICH themselves (and all gold holders) TO ENSURE their continued prosperity? 3. They choose to BID FOR GOLD at a measurably higher price? For example, USD 1 million per gram? What happens to physical gold holders? What happens to thos that hold no gold? What happens to the world economic & financial system if this happens? 5. If/When this happens, I think the world economic and financial system will stabilize. Because, all of a sudden, there is a True Store of Value in Gold. It is posited in many places that all of the world’s debt is about USD 700 trillion – This is only 700 metric tons of gold! The derivatives are estimated between USD 1 to 2 quadrillion, which is 1,000 to 2,000 tons of gold. The US debt is only 18 tons of gold. The total US liabilities (including Social Security, etc.) estimated at USD 200 trillion is only 200 tons of gold – which is the one year of gold production from US mines. 6. For everyone after SHTF, all paper based assets are lost. 7. For those people who do not hold gold – nothing changes. 8. For those countries that hold gold – they can trade with other countries. 9. For those countries that do not hold gold – they better be producers or exporters, as any imported stuff will be hard to source, because – what will they use to pay for imports? 10. For those people who hold gold – there is a windfall. They can live their lives judiciously, by spending money and helping others or go into business and employ other people. OR they can party like there’s no tomorrow and spend the windfall like water flowing through their fingers. Either way, there will be a lot of spending at the invididual level, and many more people will be working. People will be hiring people, not government. Who benefits the most? Those who own gold. A simple question – Does anyone think that the multi-generational powers that be – do not hold gold? Gold has been their wealth transfer mechanism, for centuries. There is nothing new under the sun. yes G8, they have been squirreling gold away for years. they will not wait this long. China does play for the long game. The US screwed China out of their silver last century; China is now repaying the favor – with interest. And the results will probably last a century. yes, we defaulted on the silver lease. Can you write more about this silver lease and default? First I’ve ever really heard of it. the story goes, and I fully believe it, we borrowed 300 million silver ounces for 10 years from China dating back to 2003. It was a 10 year lease and we defaulted in 2013. We have agreed to keep gold prices down so China can be paid back by accumulating cheap gold. I think that it is fully believable that a deal was made to allow China to get compensated of sorts for the silver default. Let us not forget. The West thinks short term the East thinks long term. and China was well known to have a large silver hoard. Thanks for the update. I thought it was the 70’s or the 90’s. I didn’t know it was that current. let me thank you from my heart for the wonderful blog you keep up which i found last year in december. I cannot agree more with you on your conclusions and its so rare to find simple applied logic spoken out and plainly descibed nowadays, together with useful and new info that otherwise would slip my attention. thank you much Arne and welcome to the blog. Thanks Bill – can you briefly explain how pricing gold higher devalues the yuan and reflates China’s system? a higher price of gold requires more yuan to purchase one kilo right? Also, devaluing the yuan versus other fiats will help their export sector. Another great piece, Bill! And thanks for keeping your posts in an easy-to-understand form and explaining terms for the benefit of those like me who are not completely familiar with all the machinations of international finance! (e.g. Target2) I first caught up with you when you did an interview with Greg Hunter four or five months ago and you’ve been compulsive reading ever since.You’ll be pleased to know your message is being reached as far as the mountains of the southern Philippines where I live. Also, I want to commend your readers. Their comments are equally interesting and intelligent. Moreover, devoid of all the personal attacks, abuse and unnecessary foul language that appears on so many sites. thank you John and welcome to the blog! Nice article but..gold is the same price in $USD as in Nov 2009. And of course it is higher than what is was in say Aug 2007. However it is a lot lower than what it was in Aug 2011. And it is still in a downtrend. HOLD YOUR FIRE BOYS AND GIRLS. so, your advice is to wait until after China announces their holdings? We are leaving Athens today. The city centre is currently shut down as thousands of Greek miners are protesting about Gold mines being closed !! Hellas Gold – I have loads of photos if you want them . Seems odd that a bankrupt economy which will default in the coming months is actually going to close down real money mining – it makes you wonder about recent talks with Russia/ China ?? “Don’t miss the dollars while you’re so busy picking up the dimes.” So obvious, we miss it! “waiting” is a very dangerous game indeed. I hope this question isn’t too narrow, but who’s to say the western bankers and media will simply just say “so what it doesn’t matter” to any statement by China about total gold holdings. It seems they are already doing that and are able to suppress the price down or effect the sheeples sentiment toward it. They will say, so what, we have Apple computer. I mean everyone already knows that China, Russia, and India have been hoarding gold yet the western complex banking systems can manage to keep its price suppressed or keep the sheeple thinking gold is just an old relic that has no place in todays world. China will say, we have 20K tons of gold and are re-pricing it at $10,000 an ounce… the west says “so what… we have Appl, technology, food, water, and nukes” and the nonscense continues as the DOW goes up to 40,000 propped up by more money printing. because in reality it does matter. I mean I guess what I am trying to say is that gold is just one asset. I own it and believe in it but I do not believe in the majority of other people valuing it after what we have seen the last 5 years. I mean what if silk went up so high only the mega-rich could ever afford clothes with it. That doesn’t mean that all the other women won’t still look good in clothes made without silk. Or what about a large family who wants to buy a Suburban but can’t afford it. That doesn’t mean they will walk.. they might buy a mini-van instead. What if people just ignore gold and leave it just up to the rich to own. Thats already the case for some who cannot afford an ounce of gold and so they buy a few ounces of silver instead. Whats to keep the western bankers from just saying “so what” when China states it can back its currency with gold. People are so stupid they will just say, “doh, yeah but we have Monday Night Football and beer, I don’t care about f’ing gold.” and the bankers love the way their sheeple think…. so easy to manipulate. their “psyops” have gotten to you. Yeah I know, they are trying to psyops the sheep dog out of me thats for sure. But its people like you Bill, not EF Hutton whom I listen to. You do fantastic work. Thanks for all your great analysis. As I did say, I believe and own gold so when China re-prices it I am in good shape even if the bankers say “so what” and the sheeple continue playing along to their games. I mean I don’t invest in classic cars or expensive art work because I don’t under-stand it. But I know there are some who make a hell of alot off of it. Just because the majority of the sheeple may never understand or want gold (yet), doesn’t mean the wealth preservation that us PM investors have is any less. You are providing a great service to anyone who will listen why they need PM’s. thanks Rich, funny thing, I started my career at E.F. Hutton. When Bill Holter speaks… peaple listen. 🙂 At least we can hope they do. Keep up the great work you are doing.